Getting engaged to be married is supposed to be one of the happiest and most exciting times in a couple’s relationship. There are many things to consider before the marriage occurs, such as where you will move, how your bank accounts will be managed going forward, if a new last name is taken, and what happens in the event that a dissolution may occur. While many couples do not want to address the issue of what assets belong to what spouse, depending upon the state in which you enter into marriage, that property could legally become your spouse’s once you are married. Prenuptial agreements have had a negative connotation for a long time, however, they do not have to be that way. 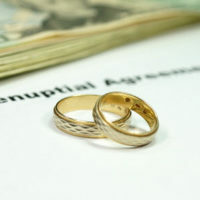 These agreements control how assets are divided or owned during the marriage as well as if the marriage dissolves, which includes not only real estate, but retirement savings accounts, debt incurred by one party, any rights to spousal support, benefits of life insurance policies, how property may be distributed upon the death of one spouse and what law will govern if a dissolution is entered into or a dispute arises. This can also be important if there is interest in assets held by another family member besides the spouse, such as an heirloom passed down or a family business being inherited. In the event of death, courts then do not have to use their discretion to make the proper decision regarding what party they feel should retain ownership. In order to make a valid prenuptial agreement, both parties must satisfy certain factors before a court will find the agreement legally enforceable. The parties must both enter into the agreement voluntarily, and it must be in writing and signed by both. Some states do require that the parties both consult lawyers separately in order to spell out without influence from the spouse what assets they seek to retain or what is important in the agreement for them. Consulting a lawyer in your own for a prenuptial agreement helps clarify the question of voluntariness and undue influence in court. The agreement becomes legally binding and effective as soon as you and your spouse marry, but can be revoked or amended at any time in the marriage upon the signed written agreement of both parties. Prenuptial agreements may have social stigma, but can be an incredibly helpful planning tool to help you and your spouse determine how assets are dealt with. If you or someone you know is considering a prenuptial agreement, please do not hesitate to call the lawyers at Lindamood & Robinson, P.C. today in our Houston office at 713-654-2112 or our Galveston County Office at 281-486-6116, or simply reach out using our website and we will contact you. We look forward to working with you to help you move onto your next chapter in life.